Skipper Ash Taylor says there is no problem with spirit in the Cobblers squad, despite several players currently finding themselves out in the first team cold. 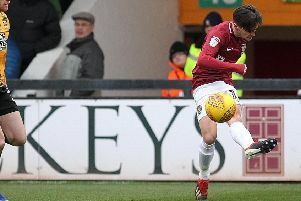 Following significant investment in the past two tranfser windows, where more than 20 players have been brought into the club, there is a very large squad at Sixfields despite plenty of players also heading out of the exit door. Taking injured trio Kevin van Veen, Aaron Pierre and Aaron Phillips out of the equation, as well as loaned out strikers Joe Iaciofano and Leon Lobjout, there are still 22 outfield players battling for Town selection every game. With a substitute goalkeeper on the bench, that means only 16 are involved on match days, and the likes of David Buchanan, Regan Poole and Yaser Kasim have found themselves sitting in the stands while their pals strut their stuff. Others, such as Shaun McWilliams, Boris Mathis and Leon Barnett, have barely ventured on to the pitch despite being involved in match day squads. It must be a huge frustration for the players not involved, but Taylor insists there are no issues, and that the squad is full of ‘great professionals’ who are ensuring they are fit and ready if called upon. “They are good professionals, and they get their head down and they work hard,” said Taylor, who has taken over the captaincy following Marc Richards’ desparture, and with Buchanan out of favour. “They know the job in hand, they know it is a squad game, and they know that injuries can happen any time and they don’t know when they could be called upon. “They have to keep themselves fit and ready to come into the squad, and to come into the team. The Cobblers were due to be in action on Saturday, but their Sky Bet League One clash at Blackpool was postponed due to a frozen pitch. Town are on the road again next weekend when they go to Bristol Rovers, where revenge will very much be on the menu following the 6-0 hammering handed out by the Gas at Sixfields in October.